This is a classic and easy to make so is ideal for a quick supper. The ingredients are not seasonal so it’s fine to make this at any time of the year. That said, it’s not the most healthy of dishes and it can be quite heavy so it's not a dish you'd want to be eating too often! Depending on the pasta you use it should certainly take no longer than about 15-20 minutes in total (and less time than that if you use fresh pasta). You can use diced streaky bacon (or even chopped roast ham) as an alternative to pancetta. You will get a different result but still a tasty one! You can use basil or rocket as an alternative to parsley. You can use pecorino as an alternative or even in addition to Parmesan cheese. Spaghetti is the classic pasta shape for this recipe but something similar like linguini or tagliatelle would be fine. This is so quick there's no significant preparation work to do. The cheeses will need to be grated - I would not advise buying pre-grated cheeses they simply don't taste as good! Buying pancetta already diced will save you some time though. Yes! 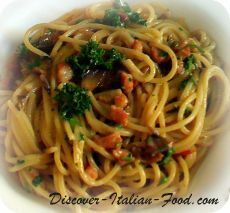 There are so many variations to this classic, some are not strictly Italian but still tasty so feel free to experiment! You could of course add some chili and garlic too. I have even seen people add ingredients such as mushrooms, peas or onions although I suppose strictly speaking that’s moving away from true ‘Carbonara’. This recipe originates from the Rome / Lazio region following the 2nd World War. Its name originates from the Italian word for charcoal possibly suggesting it was a favourite of charcoal workers in Italy. Like this recipe? Why not share it with your friends on facebook?